The Vancouver Condo Buzz » Luxury Vancouver West Side Homes for Sale at ARBUTUS RIDGE by Cressey > Spectacular Westside Vancouver Apartments Now 50% Sold Out! Spacious west side living is now here: Arbutus Ridge Vancouver is the centrepiece for this highly sought after neighbourhood. 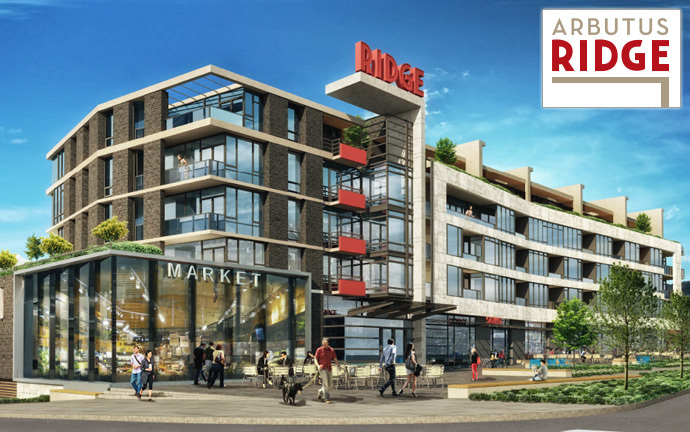 From concrete construction to high-end interior features and from spacious floor plans to great outdoor living space, the new Westside Vancouver Arbutus Ridge real estate development is one of the most promising and high-end luxury projects in recent memory. Brought to the Westside Vancouver real estate market by Cressey Development, this high-end, sophisticated residence along Arbutus Drive is all about attention to detail and fine finishes in an impeccable location. Perched high atop the Vancouver Westside neighbourhood, Arbutus Ridge by Cressey represents the high quality craftsmanship and attention to detail that today’s discerning home buyer really appreciates. The 4 storey boutique concrete low-rise building is highly sought after amongst downsizers, retirees and people who currently live in the 10 block radius around this Vancouver Westside community. As a result, Arbutus Ridge Vancouver apartments has already experienced strong success, selling over 50% of the homes in the first month of presales. One of the fabulous features of the new Westside Vancouver apartments at Arbutus Ridge is the indoor and outdoor spacious living areas. The AVERAGE 2 bedroom home at Arbutus Ridge Vancouver apartments has over 1,260 square feet of interior living space that is functional and efficiently designed. You will also be pleasantly surprised at just how large these new Westside homes are both inside as well as out – from the popular 2 bedroom plus den, 1,209 square foot C2 homes with expansive terraces listed at $989,900 to the very rare and highly sought after luxury Arbutus Ridge Vancouver townhomes that are 2 level, 2 bedroom plus den homes starting from $1,550,000. Low maintenance luxury Vancouver Westside living is now attainable. Each well appointed room will have distinct and unique high end finishing touches that set this development apart from the rest. From the ocean views and outdoor living spaces to the upscale appliances of Sub-Zero and Wolf, the amazing Arbutus Ridge Vancouver Westside condos is definitely a landmark Cressey development. All homes also come with air conditioning, in suite laundry and plenty of storage space. A sample of draft layouts are now online for this new luxury Vancouver Westside apartment development. The first layout is Unit B which is a 624 square foot 1 bedroom plus 1 bath floorplan with an outdoor area of 46 square feet. The spacious Unit A Arbutus Ridge floorplan features 682 sqft interior plus 34 square foot outdoor balcony. It’s a 1 bedroom and den with 1 full bathroom. The draft Arbutus Ridge Vancouver floor plan Unit C is a spacious 1,209 square foot 2 bedroom and den unit with 84 square feet of outdoor living. It has 2 full bathrooms and a powder room for extra convenience. The featured penthouse suite at Arbutus Ridge is Penthouse A which is between 1,080 to 1,096 square feet with 2 bedrooms and 2.5 baths. The roof terrace (plus 2 terrace balconies on the main floor) equal to about 1,059 square feet of outdoor living space! Many of these penthouses will also have premium views. The ultra-exclusive Westside Vancouver Arbutus Ridge townhomes will feature 2 level floorplans at around 1,803 square feet in interior living space with 428 sqft outdoor areas on the main level (patio). For more information about Arbutus Ridge Vancouver Westside condos and penthouses, please visit http://www.cressey.com/arbutus-ridge/ today for all the details.